While a Royal Malaysian Customs Department (Kastam) official announced three days ago that fuel will not be exempted from Goods and Services Tax (GST), Deputy Finance Minister Datuk Ahmad Maslan has denied the claim, instead saying that no decision has been made on that matter. The earlier suggestion would imply that the price of petrol is set to increase (GST will be fixed at 6%) come April 2015. That may not be the case at all, as the ministry “has not made a final decision,” Ahmad Maslan told The Star. We’ll know the fate of our fuel prices soon enough, as the final list of zero-rated or tax-exempted items will be gazetted on October 10, the day Budget 2015 will be tabled in Parliament. GST on RON97 is ok.
A definite no on RON95 and diesel. I am using RON97 100%. Pay income tax 100% (not even one single cent is hidden) + clean proper business. GST on RON97 is ok for most people like me. Knowledge and education. We need to equip all Malaysian to have the knowledge and education. We need educated Malaysian. We need to have the knowledge to understand the exact petrol price, what has been subsidized, what’s the price for import and export. The cost and price breakdown for petrol. Just take ron95, how much is the country paying, how’s the trade bring done, who pocketed/benefited the most? Again it’s knowledge and education. For cars, we need Malaysian to understand the cost of the car, price breakdown from end to end. What’s causing the car price to be so expensive. If needed, just take Mercedes Benz A200 for example, and understand the cost/price breakdown. Thai/Indo is building the knowledge fast, more educated Thai/Indo now. So once majority of Asian/Asean are educated, all will be paying Global price. Again ask yourself what should be the global car price that you should be paying. You need the knowledge, what should be the price for Honda Civic? (With knowledge, you’ll be able to understand global car price). One day, all of us in developing Countries should be paying a single price (global price), with all of us understand what we are paying for (cost breakdown). Always remember to have forward thinking, never give up! Good point mate but we’re still stuck with decision on whether to make English as a passing subject in our local universities….long way to go for Malaysia! Just buy Proton later Gov and Tun help you more. its okay. Corruption is just an economic defect. I am very happy if the government apply the car selling price of Langkawi/Labuan to whole Malaysia. This is fairer to everyone. Why do we (West/East Msian) have to pay more than our fellow friends in Langkawi/Labuan? Do we breath better air? Enjoy cheaper income tax? Enjoy cheaper petrol? We are not definitely just because we are not in duty free land thus we have to pay for ‘excise’ tax..
Obviously, you are the one of 53% ppl. Thanks. Kindly educate these 47% continuosly. Break down on these 47% of ppl. 5. Educated, but Katak bawah tempurung. Yes or no? Poor man, you cannot even make up your mind? What are we paying you for? Harga sebenar RON 95 RM2.78..lol..just abolish RON95 la..only use RON97 and subsidy RON97, since the price so close..citizen happy..
Lol I’m not surprised with these U Turn policies anymore. How did these people end up governing our great nation…? I’m all in to abolish the subsidy and to go on better quality fuel. No more stealing fuel, no more low quality fuel and we can enjoy better cars with low emissions. September fuel prices are much lower than August. Please update it. Hrm. One department says one thing, another says another. What else is new? Undecided because there will be an election in kelantan coming soon. If he said yes to gst on fuel it is confirm bn will lose in this election. Datuk menteri cgpa 3.8 lu mabuk minum air daun ketum ke? 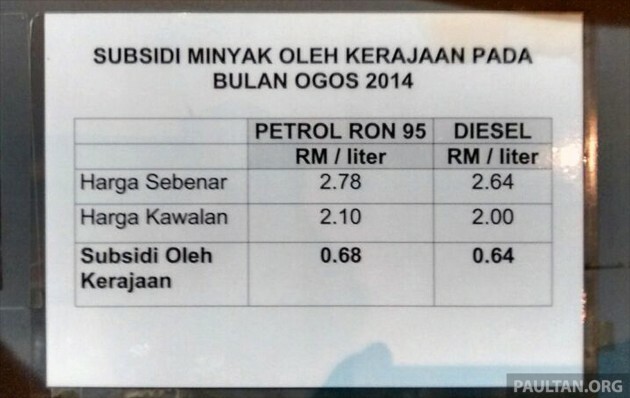 GST dah nak dekat tak boleh decide sama ada petrol n diesel ada gst ke tidak? Nak tanya sikit, petrol itu dalam kumpulan barangan keperluan ke? For a layman like me, RON95 is 3cents MORE EXPENSIVE than RON97 at this moment. Speechless, our PM says govt study GST for 30 years, yet they can’t even decide whether petrol is zero rated or standard rated!!! Menteri Kewangan ada kuasa.. don’t mess with motorhead… I know. Keep petrol out of GST list. It’s essential. . Subsidy item.. no reason for gst.. If want GST ron97.. go ahead. .premium petrol for some. Anybody remember the recent Ops Cermin Gelap fiasco this year? Its like kaki wants to go right, tangan wants to go left. The Customs said will be gst-ed….the minister said not finalised……who should the rakyat believe? But must remember…what the minister said will always be the opposite of what he meant….